Martha Grimes has long been one of those detective series writers who is one of my guilty pleasure. Her series centers on detective Richard Jury, who is a sort of Byronic/Heathcliffian hero--tall, lean, ineffably sad for no apparent reason, and hopelessly attractive to females of all ages. (Seriously. Even the six year olds like him.) His good friend is a peer from a small town named Melrose Plant, who has a puckish sense of humor, enough money to be a man of leisure, and a secret over his own past. The two men form a friendship that evolves into near side-kickery over the various books, as each begins to show the other their secret hearts. One of the difficulties of this series, however is that Grimes names each book after a whimsically named British pub, and it becomes a mental challenge to get the books read in the right order. Does "The Man With a Load of Mischief" come before or after "I Am The Only Running Footman?" Although, given the interesting names she has uncovered, I am willing to do that work. Although I am making an exception for "The Old Wine Shades, " which should have been called "Hastily Produced Contractual Obligation," or more succinctly "WTF?" The book starts with Richard Jury on a semi-informal leave from his post. He has apparently solved a previous mystery by breaking into the suspects' premises and removing several children who were in jeopardy, but without a warrant. His superior, D.C. Racer, hates Jury anyway, and uses the opportunity to lecture him at every turn, while neither suspending nor clearing him. As a result, Jury finds himself in employment limbo, unable to work on any cases, but not truly free. Entering "The Old Wine Shades," a wine bar in London, he meets a man named Harry Johnson, who has a story about a friend of his. The friend is named Hugh Gault, and Gault's wife was looking at property in the country with her eight year old autistic son and their dog. Between the first and second property, all three of them disappeared. Nine months later, the dog came back. Jury is caught up in this tale, and finds himself doing some discrete checking up on the facts. He also returns to the Old Wine Shades to hear the tale unfold. In the course of the conversation, we are treated to a fairly clunky and pedantic treatise on quantum physics, especially the paradox of Schrodinger's cat. The "mystery" is an attempt to illustrate a version of the paradox of physics--that something can be true, but not provable. Of course, in a crime novel, this is hardly new. After all, there are plenty of books in which the detective knows the solution but cannot prove it. Back in the old days of Agatha Christie and Dorothy Sayers, the criminal feels such remorse that he takes "the gentleman's solution" and kills himself before his family can be humiliated. Nearly the entire catalog of 1970s cop shows involve cops who "know" who the perpetrator is, and use unorthodox (read, illegal) methods of catching the bad guys. And Jessica Fletcher ended every hour of detection describing a bizarre set of facts that are completely unprovable unless the suspect confesses. In this case, the facts seem to line up--Hugh Gault really exists, living as reported in a sanatorium. The real estate agent supports the event--the woman, her son and dog did take the keys to two different properties, saw the first one and called the office, then was never heard from again. The keys were never returned. The dog, who came back, is now sitting under the barstool of the man telling the tale. Then, the body of "Mrs. Gault" turns up, except she isn't. When Jury goes to the sanatorium to ask Hugh Gault to come identify his wife's body, his wife is actually there visiting him. The real Mrs. Gault had been in the south of France dealing with her grief over the death of their eight year old autistic son in a sailing accident nearly a year before. Nothing is as it appeared. In fact, it seems that Harry Johnson is some sort of a sociopath who set up the scenario, using his Italian girlfriend to play the wife, borrowing a boy from a badly run special school to portray the son, and using his own dog. The girlfriend represents herself as "Mrs. Gault" and does in fact go to look at the first property, then drives away from the second without making any further contact with the rental agent. The boy is dropped back at the school, and nothing happens for nine months, until Johnson meets Jury in the bar. The boy from the school is subsequently kidnapped, along with a little girl, and stashed in Harry Johnson's basement. Why? Was he going to keep them there for a while? Was he going to kill them? He has already killed his girlfriend--so why has he saddled himself with these two kids, taking risks to keep them unharmed? Why does Grimes drag Melrose Plant into the story only to force him to get a make-over to impersonate Niels Bohr? Why does she have the dog narrate at least two chapters? Who knows? In the end, Jury becomes convinced that Harry Johnson has set this all up and that Jury will never be able to prove it. Did Johnson know who Jury was when he started telling the story? Had he set the whole thing up for a reason? The answer is unknowable--like the fate of Schrodinger's cat, and unprovable. In a series as long lasting as this one, there are bound to be one or two clunkers. This is one of those clunkers. Don't judge the series on this book--in fact, don't read this one at all. This novel sucked you in like a tornado and then left you in the midst of a pile of rubble. I enjoyed this tale immensely and even learned a bit of physics in the process. Grimes always leaves me chuckling about her situations and her humorous dialogue. This tale took some well-deserved shots at "chick lit" crime stories that I , like she, consider to be a waste of time. I agree completely with the review and with Lorraine's comment. I had the same questions as the reviewer about the story, as well as the basic one of why Harry Johnson killed Mrs. Gault's impersonator. He apparently planned to kill her nine months before he actually did--but why? Just to prove his ability to fool the authorities? A very unsatisfying mystery. Joelle: I reread the last chapter and was left scratching my head wondering if I was missing some subtle clue....I am so glad I read this review, I had the same questions...what was the whole point of that elaborate charade and what was he ultimately planning on doing with these kids? 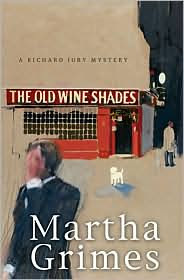 Old wine shades certainly wasn't her typical Jury novel, but I took it more of a lark for a great writer, maybe an exercise to keep from getting in a rut. I wouldn't recommend it for 1st-time readers of Grimes, but her wit and smart dialog still makes it a fun, but possibly frustrating read for those who are already fans. Doubt in the--what should I call it?--*integrity*? of this mystery took a long time to grow. And as is often the case in Grimes' paths to solution, the doubt began with a near throw-away mistake on (in my copy) page 298. "[Jury] pulled out [a book] called Gravity Revisited. A physicist's nod to E. M. Forster?" Further reading failed to prove that this was Jury's mistake rather than Grimes'. How did both Grimes and her editors fail to realize that this was a nod to Waugh, not to Forster?